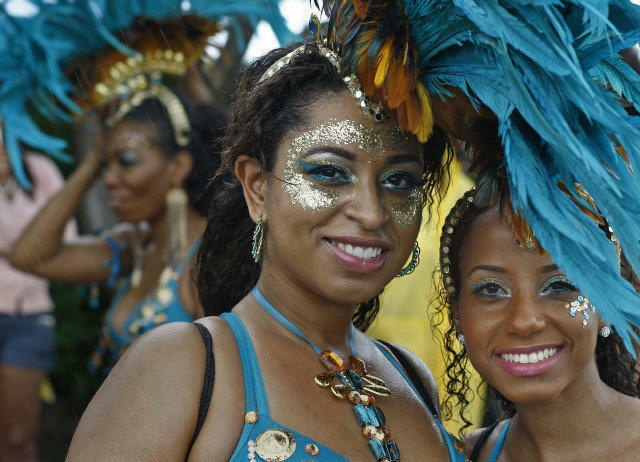 Dana Matthews (left) and Tarakaye Clunis, participated in Miami Broward One Carnival in Miami Gardens in 2011. This week's parade is Sunday. Click here to hear the radio version of this post by Miami Herald reporter Karen Rundlet. Giselle Blanche is working late nights until Carnival morning to finish up the costumes. She is one part seamstress, one part promoter and one part singer. Blanche, known on the circuit as the Wassi One, gives us a taste and a feel for the upcoming celebration which is a combination of party and theatre. Giselle Blanche is known on the Caribbean Carnival circuit as the Wassi One. “Wassi” is a Trinidadian slang word that means “fun loving.” There is no room for cars in her garage. But Blanche is more than just costume designer and seamstress. She’s a promoter and a performer, having been at this Carnival thing for decades. Right now though, Blanche is all about the costumes. Carnival is a high-energy party but it’s also theater and costumes can make a show pop. There are Carnivals all over the world. England’s is in Notting Hill, Canada hosts one in Quebec, and Carnival is even celebrated in several towns in Belgium. The Wassi One shows off her themed collection. The Wassi One’s mother, Maureen Blanche, sits to the side, armed with a glue gun and containers of baubles. Creating the costumes is a family business and a family pleasure. Home is Trinidad & Tobago, twin islands that lie a stone’s throw from Venezuela. While Miami Broward Carnival draws visitors from all the islands and all over the U.S., Trinidad was the first Caribbean island to host it. Trinidad is so serious about Carnival, they start planning it a year in advance and is known as one of the best carnivals on the planet. Whether or not a hurricane hits South Florida, residents pay a price. Insurance is the biggie for most people. On the flipside, however, there are companies here that exist and even thrive specifically because of hurricane season. Steve Sherman is CEO of the Hurricane Store, an online business based in Davie that sells emergency supplies and kits. He loves his product.